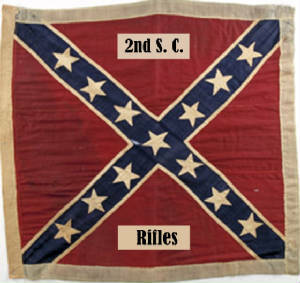 The Second Regimental Rifles South Carolina Volunteers is a non-profit Historical and Living History Society composed primarily of men and women from Anderson, Oconee and Pickens Counties of the Upcountry of South Carolina. It is the intent of the members of the unit to present to the general public a historically accurate depiction of the life of the common soldier and civilian of the period from 1861 to 1865 both Confederate and Union. We primarily depict the Second Regimental Rifles of the South Carolina Volunteer Infantry because this regiment was mainly recruited from the area. And has members that can directly trace their ancestors to it. When it is needed to wear the blue uniform of the North the unit protrays the 16th Michigan Volunteers. This unit the 2nd SC Rifles(shortened version) is a member of the Southern Guards Brigade, an umbrella group representing reenactment regiments from SC, GA, TN, KY and VA. The 2nd SC Rifles are part of Kershaw's Brigade within the SGB. Our living history activities consist of four main presentations, lectures at local schools, daily life demonstrations at local community events, lantern tours (a series of vignettes presented at night and illuminated by candles or lanterns) and reenactments of period battles (both actual and generic). We are a family-friendly unit of reenactors and living historians. The 2nd SC Rifles is eager to recruit people with a serious interest in experiencing, understanding, and teaching others about the War Between the States (WBTS). No other event in history grips the American public's imagination like the WBTS period. By understanding how the war affected everyday people like ourselves and explaining it to others, we fill a "big gap" in the education most people do not receive otherwise. DISCLAIMER: The 2nd South Carolina Rifles does not promote hate in any fashion nor belongs too or assocates with any hate related groups, parties or organizations . The 2nd Regiment Rifles South Carolina Volunteers are a registered 501(c)(3) Non-Profit Originzation with the State of South Carolina.